A Service Plan from Gas Doctor ensures that your heating system gets the inclusive preventative maintenance it needs to run smoothly and efficiently. 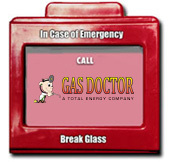 Gas Doctor currently offers two service plans to cover Natural Gas or Propane heating equipment. The two plans cover the same parts but are differentiated by the energy efficiency of your system. Boilers and Furnaces are rated for energy efficiency based on their AFUE rating or Annual Fuel Utilization Efficiency. Our High Efficiency Plan covers boilers or furnaces that are Energy Star rated with an AFUE rating of 90% or higher. This includes condensing boilers and furnaces and on demand tankless heaters. The Standard Atmospheric plan covers boilers or furnaces with an AFUE rating of 89% or lower, that includes systems with a pilot or chimney vent. During the inspection of your boiler or furnace our technician will inform you which plan your system falls under. Gas Doctor service plans cover all the parts that are listed below and the labor that is associated with the parts. You are not required to have purchased the heating system through the Gas Doctor to enroll in the service plan. To enroll in the service plan Gas Doctor will have to thoroughly inspect your system. If the system has not been serviced in a while we will schedule a tune up prior to enrollment. Gas Doctor services 60+ cities and towns in Rhode Island and Southeastern Massachusetts. Just enter your zip code below. Thorough inspection of Boiler/Furnace interior and exterior surfaces, plus inspection of the fire box area. Efficiency tests are performed with state-of-the-art instruments for maximum efficiency. Service Plans are effective for one year from the billing invoice date. Furnace and boiler inspections are performed April 1 to September 30 only, during normal business hours. EMERGENCY SERVICE is defined as having no heat or hot water. This agreement also does not cover services, repair or replacement of parts as a result of abnormal conditions beyond our control such as but not limited to, acts of God, war, flood, fire, hurricane, explosion, vandalism, and freeze-ups. Furthermore, Gas Doctor is not liable for the inability to supply parts that are no longer available due to obsolescence. This agreement is not written on a pro-rated basis and no refund will be given if cancelled prior to expiration date. We reserve the right to rescind or cancel the agreement without notice if any of the conditions set forth are not met. The acceptance of all service plans by Gas Doctor are contingent upon inspection of your system and/or equipment by one of our licensed technicians. Any defective parts or systems not up to code will not be covered by the plan. Your service plan will be automatically renewed on its anniversary date. Such renewal shall be subject to any price changes made by Gas Doctor and its affiliates. Gas Doctor and its affiliates has the rights to modify the general terms and conditions for service plans at any time.